The Gilded Age is a term coined by Mark Twain used to describe the time from 1870s to about 1900. In his work The Gilded Age: a Tale of Today Twain satirized an era of serious social problems masked by a thing gold lining. The gilded age was an era of rapid economic growth. The rapid expansion of industrialization led to real wage growth of 60% between 1860 and 1890, despite the ever-increasing labor force. Railroads were the major industry, but the factory system, mining, and finance increased in importance. Immigration led to the rapid growth of the West, based on farming, ranching and mining. After the American Civil War the South remained economically devastated its economy tied to cotton and tobacco production suffered from low prices and rising costs. The Gilded Age was also the time when the science of chiropractic was founded and developed. In 1878 a man named Harvey Lillard lost hearing in his left ear after lifting a heavy weight while in a stooped and cramped position. He will later become the first “chiropractic patient” in 1895. In 1880 there were 269 members of the Texas State Medical Association. They comprised only 10 percent of Texas physicians, indicating there are some 2,690 practicing physicians in Texas in 1880 serving a population of 1,591,749. A ratio of 1 licensed physician per every 591 citizens. In 2014 there are 58,181 physicians serving 26,956,958 citizens for a ratio of 1 physician for every 463 citizens. Prior to 1882 D. D. Palmer and Willard Carver were neighbors and frequently discussed matters of anatomy and physiology. On September 14, 1882, D. D. Palmer’s son Bartlett Joshua Palmer is born. B. J.’s mother his mother dies soon afterward and D. D. “soon married” his second wife. In 1886 Iowa passed a medical practice act. The law had rarely been enforced, perhaps owing to the public's continuing reluctance to accept the exclusive authority of any one branch of the healing arts. Orthodox medicine was only beginning to establish its scientific authority; the first randomized, controlled clinical trials of pharmaceuticals were still nearly four decades in the future. D.D. Palmer leaves the grocery business and studies magnetic healing with Dr. Paul Caster of Ottumwa, Iowa. 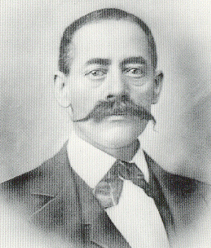 In 1887 Clyde M. Keeler, D.C., Ph.C. (left) was born in Kansas, on June 2. Dr. Keeler will become the namesake for the Texas Chiropractic Association’s most prestigious award. The first and third would have a substantial chiropractic legacy, while Dr. Andrew Taylor Still would found osteopathy. After graduating D. D. Palmer establishes a practice in Burlington, Iowa. Later that year D. D. Palmer, age 43, moves to Davenport, Iowa and his neighbor Willard Carver enters law school there the same year. In San Antonio, Texas, sometime after 1888 and before 1892 the Alamo Fire Insurance building is constructed in San Antonio at the corner of College Street and Navarro. Around 1912 it will become the Central Office Building and will house the Chiropractic College of San Antonio, which will become the Texas Chiropractic College. By 1889 “the modern medical practice acts, which required graduation from medical school, now placed the licensing function in state agencies, and medical schools no longer could license their graduates." Frank Dent was a physician of the Eclectic sect, a group which accepted and taught the conventional medical science of the time. However, in the area of therapeutics, the Eclectics carried on a rigorous campaign against excesses of drugging and bleeding, which were still practices used by many physicians at the time. In addition, all but one of their medical schools were open to women. Dent had been in practice for six years when he was convicted under an 1882 West Virginia law which required physicians to hold a degree from a reputable medical college, pass an examination, or prove practice in West Virginia for the previous ten years. In this case, the State Board of Health refused to accept Dent's degree from the American Medical Eclectic College of Cincinnati. The decision in Dent v. West Virgina ultimately led to licensure of professional occupations. Ten professional occupations became immediately subject to state licensure and regulation by the end of the 1800s. By 1920 some 30 occupations were subject to licensure and regulation and by 1977, 35 health care professions were licensed and regulated in various states.